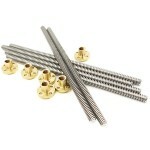 Material: 304 Stainless steel lead screw / Brass nut Screw diameter:8mm Pitch:2mm Lea..
Material: 304 Stainless steel lead screw / Brass nut Screw diameter:8mm Pitch:..
HR0646 T8x400mm trapezoidal Lead Screw 350MM Rod T Shape Linear Rail Bar Shaft with Brass Nut &nb.. 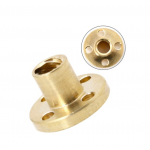 Description: l Item Type: Flange Nut For 3D Printer T8 Lead Screw l Material: Brass l Color.. 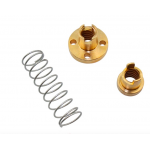 Description: Diameter of string: 1.2 mm Outside diameter: 7.5 mm Inner diameter: ..
HS0591 T8 anti backlash spring loaded nut elimination gap nut ..